$85.00 - Price includes - (1) 20"x20" canvas, paint, brushes and two drink tickets. Kizer Arts Presents Paint and Sip, a one of a kind experience! 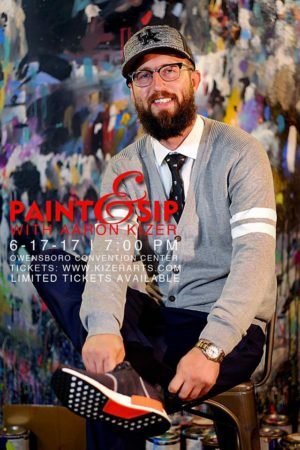 Watch Aaron Kizer perform two live paintings at the Owensboro Convention Center, then get ready to attempt to paint one of your own. Aaron will instruct you step by step on how to paint your own version of a Kizer Arts painting. We can’t wait to see what you create! $85 price includes – (1) 20″x20″ canvas, paint, brushes and two drink tickets. Limited tickets available.